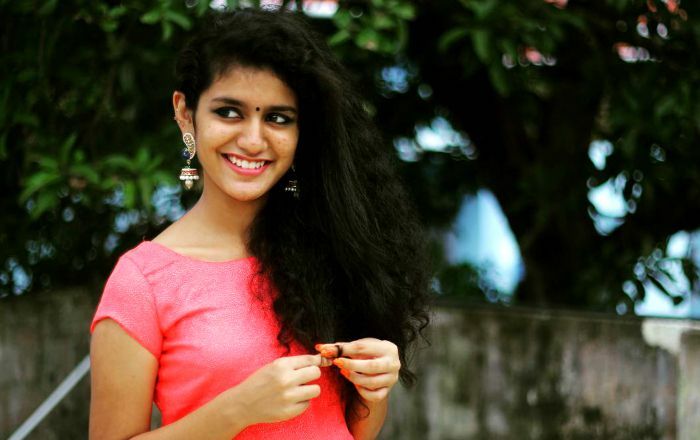 Priya Prakash Varrier is a South Indian film actress who took the internet by storm with a video short of the song Manikya Malaraya Poovi from an upcoming Malayalam movie ‘Oru Adaar Love’. She has stolen everyone’s heart overnight with her pristine expressions that would make one fall for her. Priya Prakash Varrier was born on 28 October 1999, in Punkunnam, Thrissur, Kerala, India. She is pursuing her B. Com degree at Vimala College, Thrissur, Kerala. Due to her low profile, there is not much information available of any relationship she has had in the past or in the present. Priya Prakash Varrier is making her debut with the 2018 Malayalam film, Oru Adaar Love, a film about high-school life, directed by Omar Ali. She hasn’t been a cast in any TV show or series. The budding damsel made the internet crazy with her lovely expressions from the song Manikya Malaraya Poovi of her debut flick. Priya wanted to become an actor since she was a child and took up modeling after her high school so that she would easily enter the mainstream cinema. She is a trained Mohiniyattom dancer. She also learns classical music. She has participated in several beauty pageants. Priya has acted in three short films including Kadalasu Thoni and Third Flip directed by Lewin Louies Thattil. The young beauty has walked the runway for several cultural events and fashion shows including Aiswaryarani 2017 and Kochi Fashion Show 2017. In 2018, she was featured in a Tamil music video, Nee Vaanam Naan Mazhai. Priya is an active social media user. She has earned over 1.5 million followers on Instagram through the weekend since the song went viral on the internet. She has already signed her second project and definitely, the young leggy lass will go places.